Matilda’s friend Jemima has recovered from her illness and they are both now back out with their friends on the pad. Janice and Holly were especially pleased to see their friends arrive back onto the pad and they were very excited when they all saw each other. 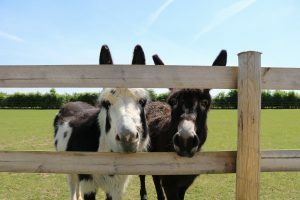 Matilda has been lapping up the attention at the Visitor Centre over half term as she and her friend Jemima have spent some time in the stable down there. Jemima hasn’t been feeling herself and has had tests to try and determine the cause which has meant she has had to have her tummy clipped. She wasn’t too impressed with her new haircut, but Matilda is being a great friend and is trying to help her feel better soon. 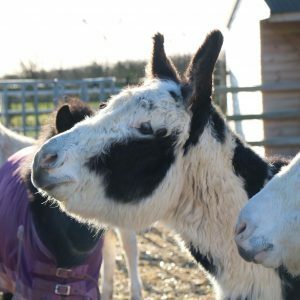 Matilda loves all of the attention from our visitors and can’t wait to see everyone for our donkey friend talk on the 15th February. 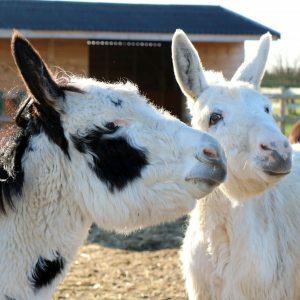 She is looking forward to showing off to everyone and introducing people to her donkey friends – especially her best friend Jemima, who she is never far away from. 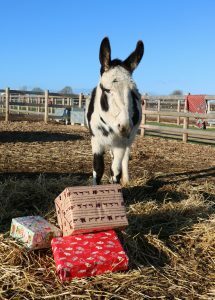 Matilda thoroughly enjoyed her Christmas with lots of visitors coming to see her over the festive period. She received a lot of fuss and even bagged herself a few adoptions at the same time! Matilda is never far away from her good friend Jemima and they are both really enjoying the extra straw and pulling it out the feeders, it’s like a little game! Matilda is on the award board this week after her farrier visit. 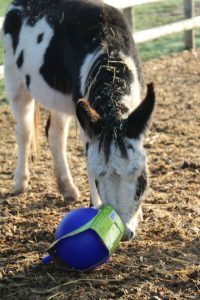 The donkeys have their feet checked every three weeks to ensure there isn’t any problems and the farrier was so impressed with her behaviour she received the ‘Most Improved Donkey’ Award. Staff think they may have given her a little too much praise for being so well behaved as she marched back to the field and proceeded to show off her new-found fame to her friends like a true diva. 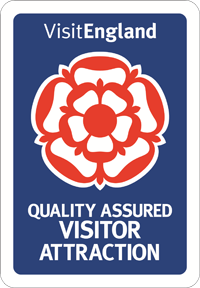 Matilda has been thrilled with the number of visitors that have been to visit her throughout the half term holidays, especially as the Halloween Spook Trail went right by her field which prompted people to stop and give her a bottom scratch as they went by. 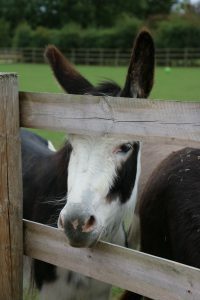 Although staff were not convinced this wasn’t initiated by Matilda as they noticed she looked very sweet to tempt people towards the fence line, then would turn right round for a scratch, the cheeky donkey! 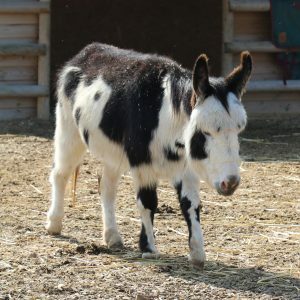 It’s not just visitors that have fallen for her trick, she has often been following staff around the field as they poo pick until they take notice of her and she whips round for a scratch! 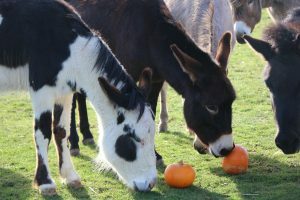 Matilda has soon cheered up with some extra attention from visitors at the annual Autumn Fayre. Instead of spending time on her own she is now rarely seen away from the fence line waiting to grab the attention of any passers-by. Matilda has been very accommodating for her regular poo sample, which was very much appreciated by staff. This will determine what worming programme Matilda will need, if any. Matilda is glad the hottest weather is now behind us, and she can now enjoy the cooler sunshine all day long. Staff have noticed Matilda getting a little grumpier lately, so have been spending time with her giving her some extra attention to see if this cheers her up. Matilda has continued to enjoy her baths and has had a relaxing pamper from staff to help remove her thick coat in the hot weather. By removing some of her coat she was immediately more comfortable. 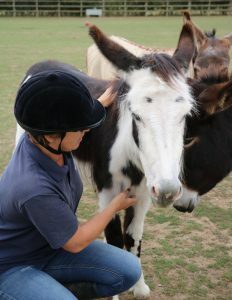 She is also still wearing her fly mask to protect her face in the blazing sunshine we have had in Lincolnshire. It’s has been Matilda’s weight day this month, where she was very reluctant to get on the scales! With a little encouragement and fuss from staff she eventually got on and is thankfully is a healthy weight with no concerns. Just like some of her friends, she too has enjoyed a cold bath in the middle of the day to help keep her cool in the sunshine, and she loved the opportunity to get a bum scratch too! Matilda has moved back to the Visitor Centre to be with the rest of her friends and is very happy to be back on the grass! 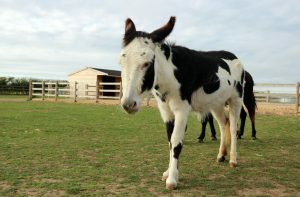 She and her good friends Jemima, Holly and Janice have been enjoying the sunshine over the May half term. If you have been to visit Matilda lately you may have noticed she is wearing a mask as she has pink skin under her eyes, just like her mum Gnasher, so the mask protects her from burning in the sun. Matilda has been very happy in the warmer weather and is looking forward to her springtime groom to remove her thick winter coat. Her and her friends have been able to have access to the outside of their barn while the sun shined and she has been making the most of it with a couple of hours of sunbathing. 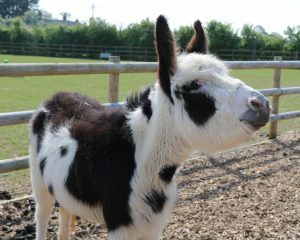 Matilda has made the move to Walklands Farm to dry conditions as she is one of the donkeys suffering with seedy toe. She now no longer needs to have her feet poulticed and instead is having her feet sprayed with iodine spray to help the condition. 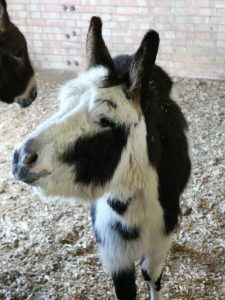 Despite this she is still in high spirits and enjoying her temporary winter home with some of the other donkeys.